When Christine Diane Barretto quit her job as pastry chef at the Smoke Co, she decided to partner with DJ Gautham Reddy to open a juicery in their neighbourhood of HRBR Layout. The duo wanted to put back “the good stuff in your body”, while still keeping it delicious, at The Juice Shop. 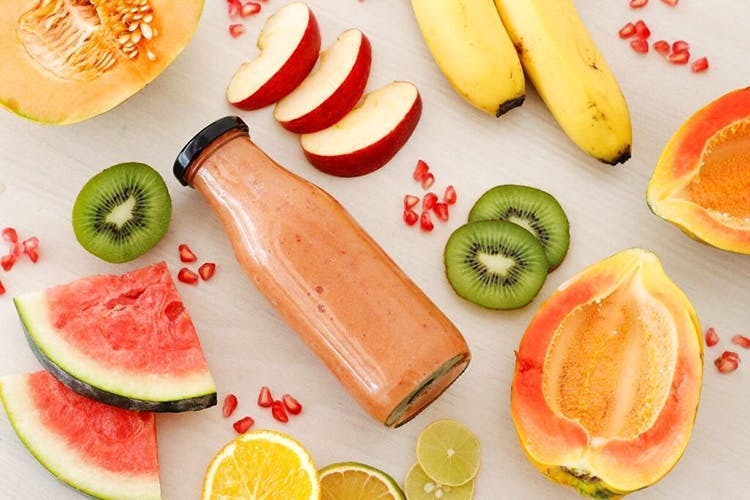 So enter thick fresh fruit juices, healthy-ish sandwiches and even desserts such as cheesecake, brownies, blondies, and cookies with jaggery or honey as sugar substitute. Pick from Health Boosters in the form of freshly pressed thick juices, with little or no water and sugar, and a bunch of sandwiches. Christine recommends their Immune Booster juice with freshly pressed orange, kiwi, lime and honey, blitzed with a bit of ice. Sandwiches include chilli cheese, paneer and veggies to chicken mayo, tikka and sausages to pick from. Plus, Nutella Banana anyone? We hear there will be sourdough sandwiches on offer too soon with everything from avocados to spinach. But we are most interested in the desserts section, which promises cheesecake, chewy fudgy dark chocolate brownies and a bunch of cookies such as brown butter dark chocolate, white chocolate and chocolate chip.